For quite some time now, my love for Rihanna has been the most selfless feeling I’ve harbored. I understand that you, dear reader, may feel the same. I want nothing but the best for my queen. Sure, for a brief couple weeks in 2018 (the year that will not end) I grumbled about needing new music from the singer, beauty blogger and mogul of ... lit’rally everything she touches. But then I saw how my tatas sat in her Fenty x Savage bras and I was like, you know what, just do whatever you want for the rest of your life, Robyn. You got this. So it is with nothing but the deepest, purest pleasure that I report that Rihanna is happily in love and very much still with her hot Saudi billionaire boyfriend, Hassan Jameel. According to Page Six (h/t ELLE), a source close to Rihanna (who is, sadly, not me) confirmed that the singer and her idiot ex-boyfriend Chris Brown are not in contact, despite his thirsty dives into her Instagram comments. The source went on to say that Rihanna is still with Jameel and is “very much smitten” by him. 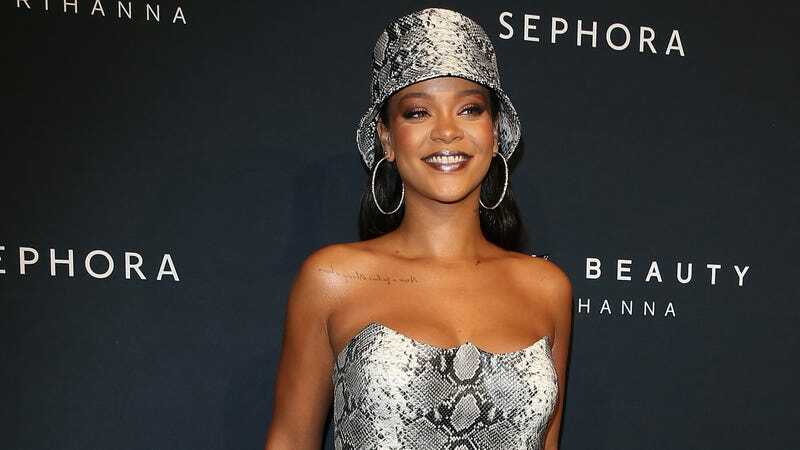 As Elle notes, Rihanna’s own Instagram subtly alluded to their connection recently, with the Fenty Beauty founder posting a photo of a Rivian car—apparently, Jameel invests in the automotive company. The two were also photographed—separately—at a Rivian event on Monday. I’m here for smitten Rihanna. I’m here for single, completely-bankrupt-of-fucks Rihanna. If you like it, my rude gal queen, I love it. And for all the gifts you have given me, from the Killawatt highlighter that stays blessing my cheekbones to all the moody-girl anthems on Anti to all winks-that-aren’t-quite-winks-but-that’s-fine-it-just-makes-you-cuter-how-is-that-even-possible, know this: You deserve.